"Mrs. Grinchley's Christmas Carol" Returns! Guess Who's Comin' To Christmas Dinner -- Again? Return In "Mrs. Grinchley's Christmas Carol"
In 1995 Ryan Landry's now legendary Gold Dust Orphans came to theatrical life. In fact, it was right here in Boston that they staged their very first play, a little yuletide fable entitled "How Mrs. Grinchley Swiped Christmas." That show marked the beginning of what would prove to be, (much to the local theater community's rather uptight shegrin) one of Boston's most infamous theatrical success stories. In 2010, the beloved characters returned to star in the award-winning "Mrs. Grinchley's Christmas Carol." Now, after last year's sold out run, "Mrs. Grinchley" returns to unleash her holiday mayhem from December 3 - 18 at Machine, 1254 Boylston Street in Boston. 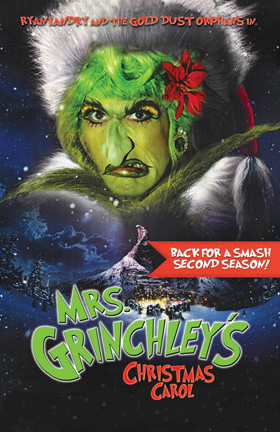 Within a tale based on Dickens' A Christmas Carol, the show's villain, the old booze hound Mrs. Grinchley, steps into Mr. Scrooge's legendary seal skin slippers and reluctantly travels via Spirits, through her grotesquely checkered past and her absolutely rancid present to land within the depths of her violently putrid future. This year's production brings a whole new bevy of special guests, including Adele, Lindsay Lohan, Paul Lynde, Beyonce and the return of a lame little dog named "Teeny Tiny Tim." Peppered with puppets and sprinkled with merry songs and dances, "Mrs. Grinchley's Christmas Carol" is a certified celebration that The Gold Dust Orphans believe will prove to be a time-honored holiday tradition among Boston's "hip and happening set " for many years to come. Be forewarned that "Mrs. Grinchley's Christmas Carol" is not for children . . . unless of course they happen to be alcoholic transvestites!